Let’s to see a real world example of a points type creating and configuring a Credits points type and awarding our users for logging and commenting on a specific page with 100 credits for each action. 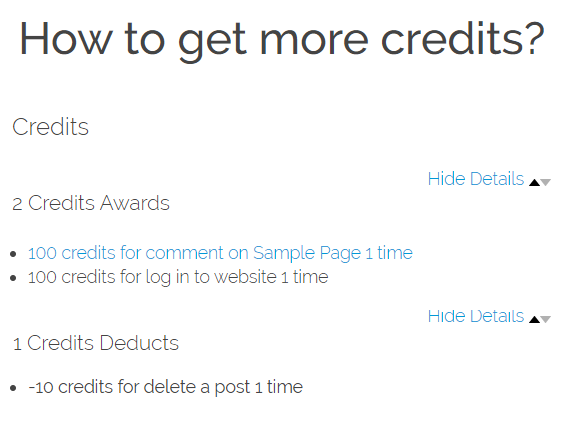 Also let’s to see how to announce to the user the existence of this credits, the requirements to earn some of this credits and finally a page with his credits balance. Access to your WordPress admin area, normally located in your_site_url/wp-admin.Navigate to GamiPress -> Points Types menu (This view is really similar to the WordPress post/pages views). At the top of this view you can find a button to add a new points type. 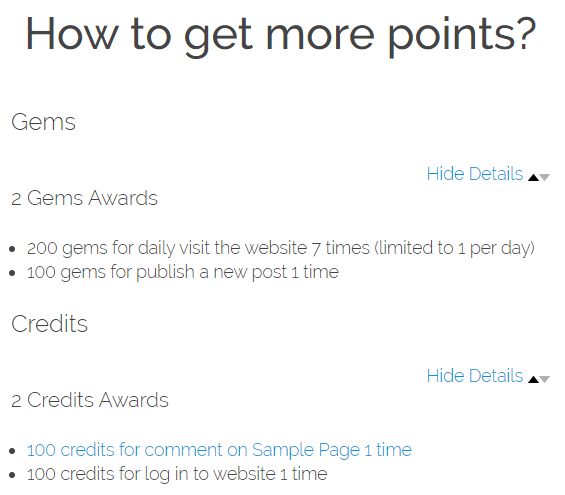 GamiPress has the possibility to automatically award an user with an amount of a points type (credits on this example) when the user performs some actions through the Points Awards. Points awards are located on the points type edit screen (after the “Points Type Data” box). Clicking on the Add New Points Award button you can add as many points awards as you want. 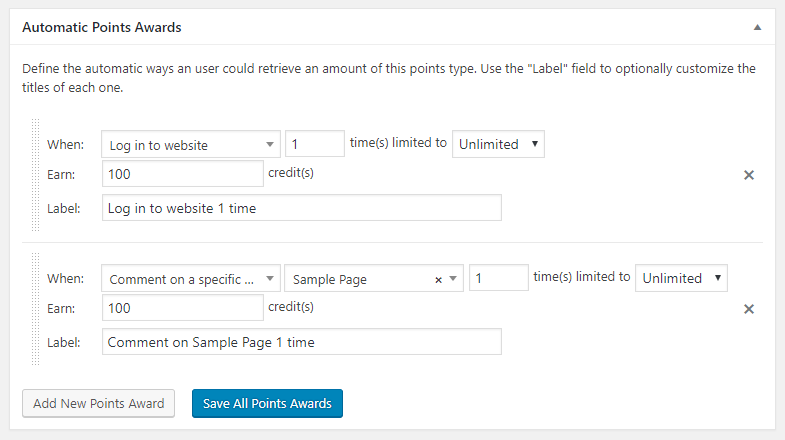 GamiPress has the possibility to automatically deduct an amount of a points type (credits on this example) when the user performs some actions through the Points Deducts. Points deducts are located on the points type edit screen (after the “Points Awards” box). Clicking on the Add New Points Deduct button you can add as many points deducts as you want. Also GamiPress comes bundled with widgets to show a list of points types on any sidebar. Also GamiPress comes bundled with widgets to show the user points balance on any sidebar.